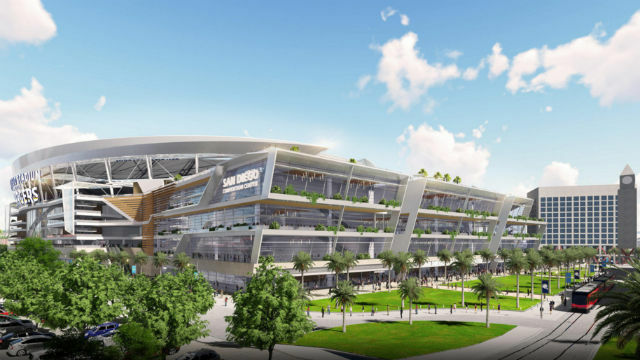 A rendering of the downtown stadium and convention center annex proposed by the Chargers. The first television advertisement in favor of the Chargers’ plans to build a downtown San Diego stadium and convention center annex is set to begin airing Thursday, according to the team. The ad, voiced by San Diego Regional Chamber of Commerce President and CEO Jerry Sanders, will appear on the Cox Communications, Time-Warner and AT&T U-verse cable systems, plus some broadcast outlets, over the next three weeks. It’s designed to boost support for Measure C, which goes before voters in November. A poll released last week showed 39 percent of likely voters plan to vote “yes.” The measure will probably need two-thirds approval to pass, with slight uncertainty created by an unrelated court case elsewhere in the state. The chamber’s board voted to endorse Measure C in July. Sanders says in his voice-over that the issue is about more than football, but the future of the city, jobs and the economy. He finishes by saying it’s smart for San Diegans. Tony Manolatos, a spokesman for Measure C opponents, said his side has no plans at this time to counter with its own ads. The Chargers’ plan is going before voters, and likely needing to surpass the two-thirds standard, because it would raise hotel room taxes to 16.5 percent to pay for the public contribution toward the estimated $1.8 billion cost of the project. The rate is currently 10.5 percent, with an extra 2 percent charge to fund tourism promotions. That would make the increase effectively four percentage points. The team and National Football League would combine to pony up $650 million.